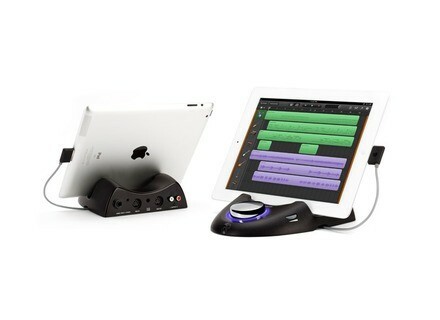 StudioConnect, Audio or MIDI interface for tablet/iDevice from Griffin Technology. ghismo's review (This content has been automatically translated from French)" Simple, effective"
I use this accessory for several months, after trying it out with an iRig. And as the iRig did not convince me of the usefulness of an iPad (iPad 2) to connect the guitar over, as this device has completely blew me away. In short, do not waste time with interfaces that plug into the headphone jack: it does not work, it's just the gadget. I use mainly StudioConnect to connect low and above the effects of pro JamUp walk pretty good, and with the coming noon, I can plug a midi pedal to change the preset hands free. It also allows me to work pieces to the headphone in a handy config: my instrument, iPad and only the headphones. It also helps me to record demos on 8 tracks Amplitube is cool enough for that. I use StudioConnect is between my bass and the amp or the headphones to work without waking up the whole house. - First, the sound is good, maybe not great, but largely sufficient to play with headphones or get between a guitar and an amp. - The price is very reasonable, if you do the math you need to provide a audio interface * and * noon, the price of two small accessories far beyond the price of studioconnect. And most importantly you never plug in both at the same time. And if we compare the interface Alesis, it is not the same at all budgets. - The interface works with all the apps I tried. - It's totally plug n play, plug it installs the app free driver, you play. With the experience I would definitely recommend this device to anyone who will operate on iPad as a musical tool. It seems you can also use the USB plugged into the Apple Camera Connection Kit card, but I have not tried for fear of compatibility issues. If an alternative exists, it may be here to look for. Interfaces that use the headphone jack are avoided like the plague.